He made his debut in late 1940 in Captain America Comics #1, fighting Nazis at every turn. Twenty years after World War II, he was found frozen in ice. Now a man living in the wrong time, he became the leader of the Avengers, and fought some of the Marvel Universe's greatest villains: Red Skull, Baron Zemo, Batroc the Leaper, MODOK, and even Cap's former sidekick, now known as the Winter Soldier. 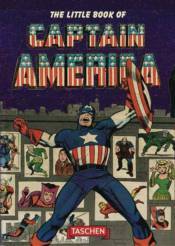 With 192 pages of images and text by Roy Thomas, The Little Book of Captain America is your ultimate guide to comics' greatest super patriot!